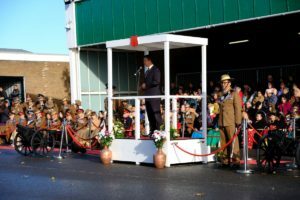 16th November marked the completion of nine months training for trainee Gurkhas at the Infantry Training Centre in Catterick. A passing out parade took place with the inspecting officer being Mark Lancaster TD VR MP, Minster for the Armed Forces. Mr Lancaster also happens to be a Colonel in the Army Reserve and started his military career in Hong Kong as an Officer in the Queen’s Gurkha Engineers. He continues to be a loyal friend of the Brigade of Gurkhas. 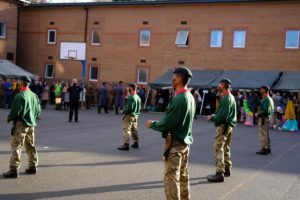 The Nepalese Ambassador, Dr. Durga Bahadur Subedi (Ambassador Extraordinary and Plenipotentiary) was also present and assisted with the inspection of the Gurkhas on parade. Mark Lancaster MP thanked all the families and friends who made the journey to be at this special occasion; many of whom had travelled long distances to be there. 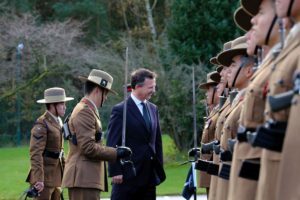 He went on to say that both the now trained Gurkhas and staff should all be proud of what they had achieved and that the Brigade of Gurkhas continues to add value to the British Army on multiple tasks around the world. He stre. ssed the strong relationship between the UK and Nepal was now over 200 years old and continued to grow stronger and both countries had a lot to offer each other. 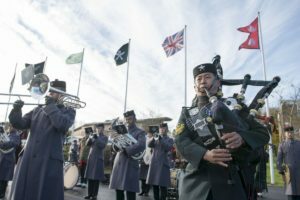 The parade was supported by the Band and Pipes and Drums of the Brigade of Gurkhas. A small number of the trainees are selected each year to join the band the pipers and drummers come from across the Brigade. After the parade the parade and guests gathered in the training lines to meet with family members and other guests and watch some demonstrations including the Kukuri Knife dance, Taekwondo and cultural dances. Lunch was then taken in the Gurkha Company Dinning hall by all parties with the principal guests on a top table. 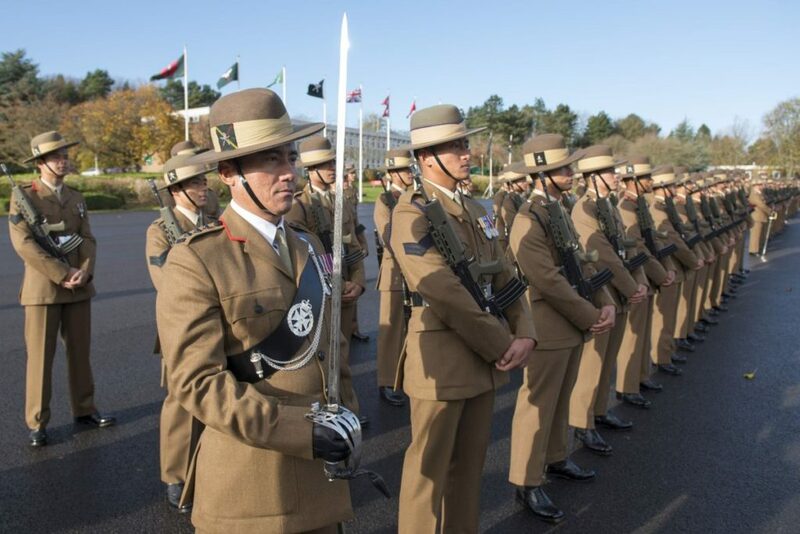 The mission is to deliver trained Gurkha soldiers in order to meet the operational requirements of the Brigade of Gurkhas. Gurkha Company currently has 71 permanent staff. It is responsible for delivering the 39 week long combat Infantryman’s Course (Gurkha). 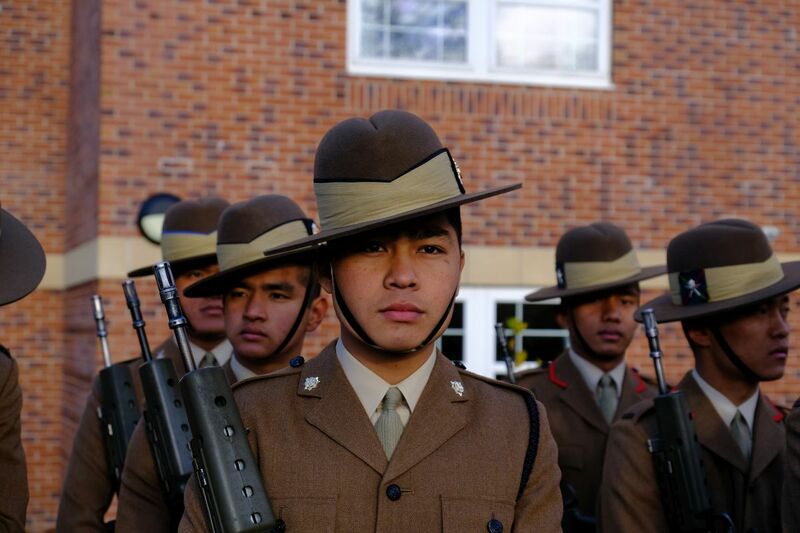 All Gurkhas serving in the British Army are trained by the Gurkha Company to become infantrymen first. This provides the Brigade with an agile edge. Until 1948 recruits for the Brigade of Gurkhas were trained in India. After Indian independence the training was centralized in North Malaya in 1951. In 1971 the training was moved to Hong Kong until 1994 when it moved to Church Crookham in the UK. In 1999 the Company was relocated to Catterick.